Sometimes when we are out buying tools we really wish we could get an all in one tool that can solve all of our problems. That is why swiss army knives became so popular world wide. A 5 in 1 tool that could help solve your everyday needs. Unfortunately we can’t always find these types of products in every walk of life. When it comes to landscaping there are many tools with interchangeable heads that try to sell as an all in one tool but they are usually a very low quality products that do not work properly. Fortunately there are notable exceptions to that rule when it comes to chain saws. Even if you are not into landscaping or outdoors work you are familiar with a chainsaw. Whether it be from cartoons or gore movies everyone knows that they are high powered cutting machines. Perhaps this puts more pressure on manufactures to put forth a product that can mimic the performance that it shows in the movies. For the people at Sun Joe performance does not have to sacrifice maneuverability. Sun Joe is the little brother company of Snow Joe. A company that first started making snow plows. They know all about developing machines that can perform under the toughest environments. This product has one of the most powerful electric motors in the industry with an 8 amp motor that will see you cut through branches up to 7.5 inches thick with ease. As for the pole it extends up to 8.6 feet it is adjustable in length. So that you can find the most comfortable distance between you and your target. This is huge for safety reasons so that you don’t have the risk of anything falling on you if cut incorrectly. Another big safety plus is the built in safety switch. So you can feel safe that your kids won’t start it by accident or anything. The always big plus of course of an automatic start and stop system. Also the versatility of being able to use it as a pole chainsaw or a typical chainsaw. The main feature for this pole saw is not its power not its pole length, but rather the dual purpose. This is is mainly a great feature because it allows the typical feel of sawing directly at the branch or log. Which is the main concern for people who first try pole saws losing the touch and accuracy in precise cuts that a normal chainsaw gives. So basically all it really is a chainsaw with an extension. 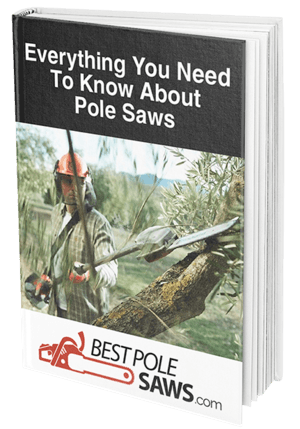 Which many people believe is what all pole saws should be. Another main feature that it includes is the automatic oiling system incorporated into many of these products. Being a fully electrical tool it real takes away a lot of the problems that people formerly had with gas powered machines. So you can forget about going out to buy gas, replacing the spark plugs, having the tank clogged up and having to dump all the gas you just bought! Mostly all of the mechanical difficulties that come with any gas powered tool. It has an 8 inch bar and chain so it's not like many of the electrical tools that sometimes looked more like razor blades than chainsaws. Since the chain is automatically oiled you really don’t have to worry all that much about its care. Also if it is ever worn out you can find replacements easily online. So while researching this product I not only tried it out I actually went online to look at some of the reviews that came from many real Sun Joe SWJ806E 8-Inch 8-Amp Electric Pole Chain Saw users. The main praises where that it comes as advertised. It is perfect for home use and cutting down normal suburban trees and branches that you’ll have to tackle. It did suffer in a little more heavy duty jobs. But chances are that if you are looking into something like this you don’t have a heavy duty job to do. If you stick to the limits that it says it can handle you will be fine. Another feature that had high praise was the conversion from pole saw to chainsaw. Truth be told it is a totally easy conversion. Literally you can complete it with the push of a button. No extra tools needed or anything like that. One of the major concerns was the oil feature. It comes with only a sample size of oil in its system. So that can be easily handled. Don’t just take it out of the box and fire it up once you get it. I know that is what we always want to do, but be sure to check at least the oil level when you first start it. If you know you are not going to be able to wait go and buy extra oil before you get the product delivered. Some people complained about how it handled fully extended.Obviously it's not easy to handle an 8 foot anything if you’ve never had previous experience. So just know your own limits. In my opinion it's a tool that works great within its limits. Like I previously stated it's not a heavy duty tool. If you need something with more power it's probably going to cost you more. I love that its a double purpose tool because sometimes you just have to get up close. If anything the knock could be that you really can’t make repairs yourself if things go wrong. However that is the knock on most electrical tools as old school people are just more used to the gas powered ones. If you just have a few issues to take care of this tool will be more than useful to you. Here you can find more reviews and ask questions directly to the seller so you can clear up all of your doubts and get to sawing!